» Ketogenic Diet 101: A Diet That Helps Or Another Myth. Ketogenic Diet 101: A Diet That Helps Or Another Myth. Are you having frustrations because your recent low-carb diet regimen is taking too long to produce results? You may have heard about the popular breakthrough of the ketogenic diet. Many people are getting more inclined to this diet plan because it responds to the demands for rapid and extreme weight loss. The ketogenic diet, or the keto diet, is an effective fat burning eating and drinking regimen that produces results in as fast as 10 days. While this turns out to be a big leap for some, others remain skeptical about its effectiveness and the possible effects that it might give to the body. The ketogenic diet is primarily rooted to Ketosis. According to the American Diabetes Association, a natural body process called ketosis happens when the body of a person is engaged to an extreme low-carbs, and to some extent, zero carb diet. During these times, the body cannot produce sufficient amount of glucose to provide energy to it. Thus, an alternative is developed where organic compounds called ketones are induced in the bloodstream instead. These ketones are the ones used when the body undergoes chemical processes to make energy. Ketone build-up is not bad all the time. It helps the body to survive when the person’s food consumption is low. The brain consumes ketones for energy instead of using sugar compounds. Several tissues in our body system, like the heart muscles, use ketones for them to function effectively. 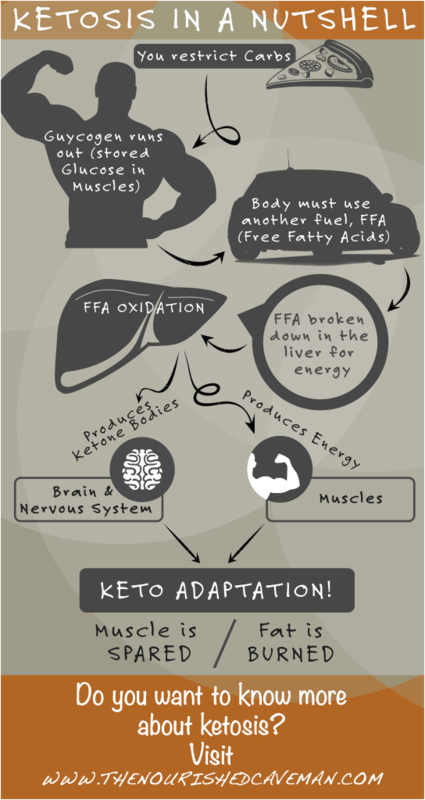 ​Here is a brief infographic on Ketosis by Vivica of The Nourished Caveman. A low-carb diet cannot be considered as a ketogenic diet all the time. These two concepts are relatively different with respect to the level of carbohydrates and proteins ingested into the body regularly. It involves monitoring of the carbohydrates' amount in foods and drinks that are being consumed by the body. As recommended, the level of carbohydrates' intake should stay between 20-60 grams a day or lesser than 50-60 grams per day. Protein is also tracked. Ideally, it has to be moderated about between 0.7g - 1.2g per pound of an ideal body weight. The amount of protein that should be consumed daily is relative to the person’s height, weight, gender, and the activity level performed by the body. This enables the body to remain in the state of ketosis. When complying the ketogenic diet procedures, the majority of calories are taken from fat. The amount of fats that should be consumed by the body accord to the consumption amount of carbohydrates and proteins. It also considers the amount of calorie intake per day. In summary, a ketogenic diet, on a daily basis, involves a large amount of calories taken from fats (about 70-75%), moderate amounts of proteins (about 20-25%), and extremely low carbohydrates' intake (about 5-10%). The following are the recorded benefits of a ketogenic diet. Diet promotes hunger. However, with the ketogenic diet, hunger is less likely to occur because fats are the primary constituents in the system. A study from the Department of Psychiatry and Behavioral Sciences in Duke University Medical Center revealed that a diet involving maximum levels of fat and proteins instead of carbohydrates would direct the body to consume lesser calories. According to a study from the Department of Kinesiology at the University of Connecticut, it promotes effective weight loss because the body consumes lesser carbohydrates. Low level of carbohydrates in the body prevents the buildup of excess water as well as the level of insulin. In effect, the kidneys efficiently segregate excessive body sodium. Additionally, since fats and proteins are the compounds developed inside instead of carbohydrates, the body shifts to burning fats. Triglycerides and cholesterol are the culprits for the cardiovascular system. These compounds are composed of fatty acids widespread in tissues and commonly circulate in the blood. Since a keto diet lessens the intake of carbohydrates in the system, the buildup of triglycerides and cholesterol in the blood are minimized according to a research study conducted by a group of medical professionals from Florida. As a result, there is a lesser risk of acquiring heart diseases. The ketogenic diet has been proved to be beneficial for type 2 diabetic people because it is effective in reducing blood glucose levels, mean body weight, and fasting serum triglycerides levels. The result is an outcome of a study done on type 2 diabetic and overweight people for 16 weeks with controlled carbohydrate consumption every day. A 24-week long experiment of ketogenic diet on 83 obese people proves the effectiveness of the ketogenic diet. The weight and body mass index of people reduced significantly. These positive results came with a specific ketogenic diet of 30 g carbohydrates, 20% saturated fat, 80% polyunsaturated and monounsaturated fat, and 1g/kg of body weight protein. The ketogenic diet is found to be useful in the treatment of epilepsy and complex seizures in some patients under the guidance of a dietitian. Seizure is a temporary disturbance of electrical activities of the brain but the epilepsy is a disorder of recurring seizures. Due to the anti-inflammatory and neuroprotective effect of ketogenic diet, it may have the positive effect to treat brain injuries of humans. However, there is no scientific evidence available that can justify its effect on humans. It is a common condition that affects ovaries functions of women with obesity, hyperinsulinemia and insulin resistance. According to a study done on 11 women, the ketogenic diet proved to be easing the condition. Decreases the level of LDL cholesterol, which prevents the body from potentially developing atherosclerosis. The diet has also found to increase HDL or good cholesterol in the body that reduces the effect of LDL cholesterol in developing atherosclerosis. Most recent researches discover its potentials in treating certain types of cancers and tumors. Some of the most recent studies find out that this diet can decrease acne buildups and skin inflammations within a 12-week time. It aids the body in managing extreme weariness or exhaustion. It improves the level of gamma amino butyric acid (GABA) which is a significant inhibitory neurotransmitter. 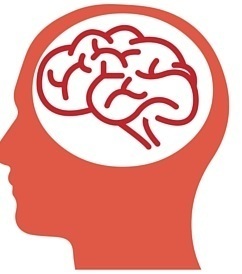 In cases of brain injuries, it helps in extinguishing toxicity brought by glutamic acid. It prevents the body from experiencing the consequences of oxidative stress and glutamic stress. While some people benefit from this diet, particularly those with health disorders, many are using this for cosmetic reasons. Medical experts said that ketogenic diets might cause undesirable effects to the body. High level of cholesterol: Since this diet tolerates extreme levels of fat and moderate levels of protein in the body, it increases the risk of cardiovascular disorders due to increased cholesterol levels.Too much cholesterol presence in the system is dangerous, especially to individuals who have cardiovascular diseases. Increases the risk for kidney problems. Especially for individuals who have kidney problems, consuming too many foods high in protein can trigger strenuous dilemmas on the kidneys. If tolerated and left ignored, this could lead to more serious kidney disorders and malfunctions. Expelled out body calcium. High-protein diets cause the body to flush out electrolytes and calcium that are beyond normal performance. If left uncontrolled, this might lead to bone diseases like osteoporosis. However, this can be prevented with constant water hydration to replenish the lost electrolytes. Micronutrient deficiencies. The study of Dr. Liu Lin Thio, MD, PhD., from the Department of Neurology at the Washington University in St. Louis, School of Medicine mentioned that the keto diet does not produce the right amount of micronutrients that are vital for our body to function properly.It is deficient in B Vitamins, Ascorbic acid or Vitamin C, Vitamin D, Iron, Magnesium, Calcium, and Carnitine. Therefore, all these minerals and vitamins should be checked and maintained as per the recommended range. Unbearable side-effects. Our body is used to process carbohydrate nutrients for fuel. Because a keto diet gets rid of carbohydrate intake, it will face a new environment. The buildup of fats is associated with establishing another arsenal of enzymes. Hence, the body has no choice but to make use of what is left inside. As a result, it will trigger side effects like nausea, vomiting, and abdominal cramps according to the Central Nervous System Practice and Research Network (PRN) of the American College of Clinical Pharmacy. Other side effects involve headache, dizziness, keto flu, and mental fogginess as reflected from the 2004 report by the Physicians Committee for Responsible Medicine. Will ketogenic diet work for you? Aiming a body that does not deviate the average normal weight is not bad. If you consider taking part in this diet regimen, it is recommended to consult with a medical professional. This is to ensure that you will not get into trouble. Moreover, doctors can even help you with the safest procedures in starting the keto diet because they already understand the dynamics of it. They can provide you with reliable diet plans so you can properly manage your everyday food and drink intake. Remember, a keto diet involves not only avoidance of carbohydrates rich dishes; it should also be incorporated with healthy and nutritious foods without compromising your health. It is true that the diet regimen focusing less on carbohydrates and increasing the protein and fat levels are effective for weight loss. Like all other diet plans, the ketogenic diet is not bad if properly managed. In fact, several scientific researches have proven the positive effects of keto diets. However, while there are positive effects, there are also negative effects it can inflict to the body. It is highly important to consider first your overall health before engaging in this kind of diet. Most importantly, it is unnecessary to conform to the ideal body shape and weight promoted by the mass media and the internet. You do not have to punish yourself from getting into diet plans that might harm you instead of providing better results. Avoid too many tips and suggestions coming from magazines and blog sites about the perfect body. After all, a diet plan is about giving yourself a healthy lifestyle. Various diets have been evolved to treat weight loss. But, what works for some may not work for other. Did you try the ketogenic diet? Please leave your thoughts on this diet and how it has impacted your health? Previous Post Top 21 best foods for weight loss: Do they really promote weight loss? Next Post I Successfully Quit Smoking without Medication: Here is How.